Wakaf Che Yeh along Jalan Kuala Krai in Kota Bharu is a favourite shopping destination in Kelantan and attracts people from all over. 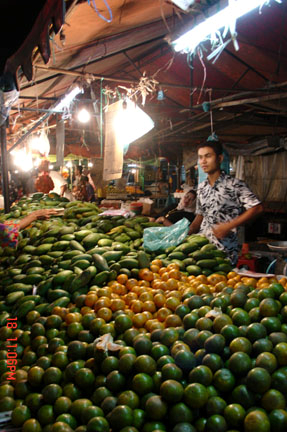 This place is actually a huge 24-hour market, which is more active at night when traders set up numerous stalls selling unusual local food, exotic tropical fruits, cheap clothes, second hand goods as well as fresh product. While most parts of Kelantan turn quiet and mild as it approaches the evenings, Wakaf Che Yeh, or Che Yeh Market, in Jalan Kuala Krai, Kota Bharu, bustles 24-hours a day. This open-air trading area, occupying about a quarter acre, is the stage for Kelantan commerce. As the day unfolds, traders enter and exit like actors in a play, changing the scene from a wholesale market to a wet market and finally to a typical local night market. In the early hours of the morning, wholesale traders assemble their goods along the road, under the glare of fluorescent lights. Huge baskets, bursting with colour and aroma are set on the ground, offering all kinds of vegetables and every imaginable spice. Everything is sold in bulk at incredible wholesale prices. The atmosphere is almost surreal as traders and buyers go about the process of buying and selling under the cloak of the night and a million stars. In the later hours of the morning, another set of traders enters the arena turning the whole place into a busy wet market. Fishermen with the morning’s catch and butchers with fresh, prime meat gather to make a sale. Scales are brought out, cleavers are sharpened, and blood, inevitably, spills. The locals shop here for the best cuts and freshest seafood – poultry, beef, fish, clams, squids. In the evening, the scene changes yet again. Trestle tables are set up within inches of each other, leaving only a narrow lane for shoppers to negotiate their way through. Stools and plastic tables are brought out, the gas stove is fired up and food is served. Music, and sometimes dikir barat tunes, blares from speakers while fairy lights twinkle in rhythm, signaling the start of the pasar malam or night market. This outdoor “shopping mall” has something for everyone. Local Kelantan food and desserts for the hungry; perfumes, shoes and clothes for the fashionable; music CDs, video CDs and even stereo systems for fans of entertainment; vegetables and fruits for the cook; traditional medicines for the weary; jewellery (including gold and gemstones) for the indulgent; and the charged, electric atmosphere for those who cannot afford anything. This is Wakaf Che Yeh at its busiest. The narrow lanes are crammed full with tourists bargaining for souvenirs and locals shopping for groceries. It’s the perfect place to practice a little Kelantanese and catch some local action till the wee hours of the morning when the whole scenario repeats itself with the arrival of the wholesalers and their huge baskets of goods. This entry was posted on Saturday, January 5th, 2008 at 12:31 pm and is filed under Cultural Events, Dining, Shopping. You can follow any responses to this entry through the RSS 2.0 feed. You can leave a response, or trackback from your own site.